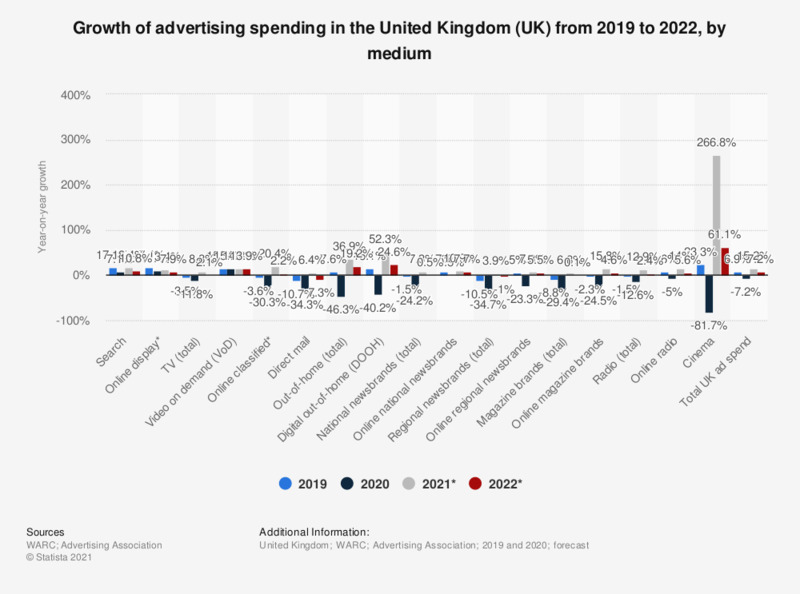 This statistic shows growth in UK ad spend in full year 2017 on 2016, broken down by media. Spending grew across all media by 4.6 percent in 2017 on 2016. The largest percentage change was for the mobile internet subcategory of internet advertising spending, which was up 37.7 percent in 2017 compared to the previous year. Overall internet advertising spend also increased compared to 2016, with a growth of 14.3 percent. * The indicated spending categories are sub-categories of main advertising media. Additional information: Broadcaster VOD, digital revenues for newsbrands and magazine brands and mobile advertising spend are also included within the internet total of £11,553m, so care should be taken to avoid double counting.